Throughout the summer and especially with the Fourth of July holiday approaching, I tend to gravitate toward classic, all-American styles and accessories. One of my favorite pieces as of late is this easy-to-wear Olive and Oak black and white striped dress – it’s comfortable and lightweight for warm days, and the waist drawstring makes it flattering on pretty much anybody. Topped off with an American flag scarf, a classic pair of aviator sunnies, and a bold, wearable red lip, I’m ready to head to a local firework display and celebrate this amazing country that we live in. Such a great All American look! 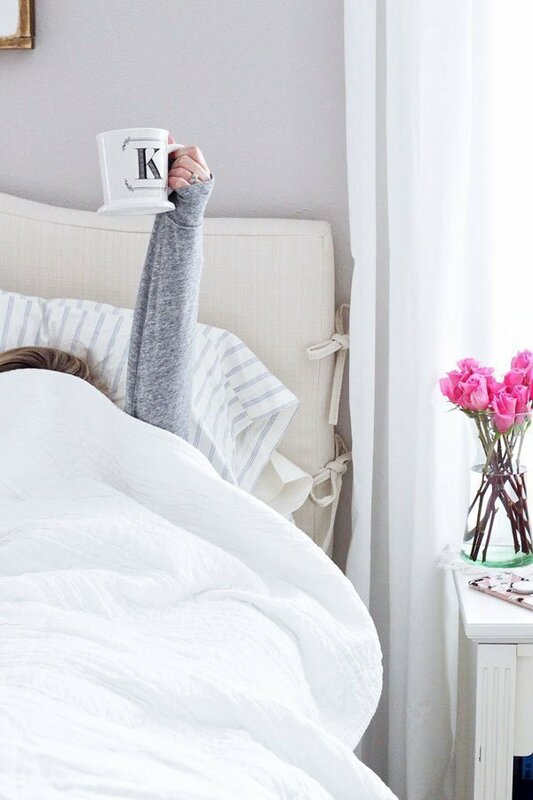 Love Olive & Oak dresses, I have some I've picked up over the years and they are so comfy! So glad you like the dress, looks so cute on you! Perfect for the Fourth or anytime! 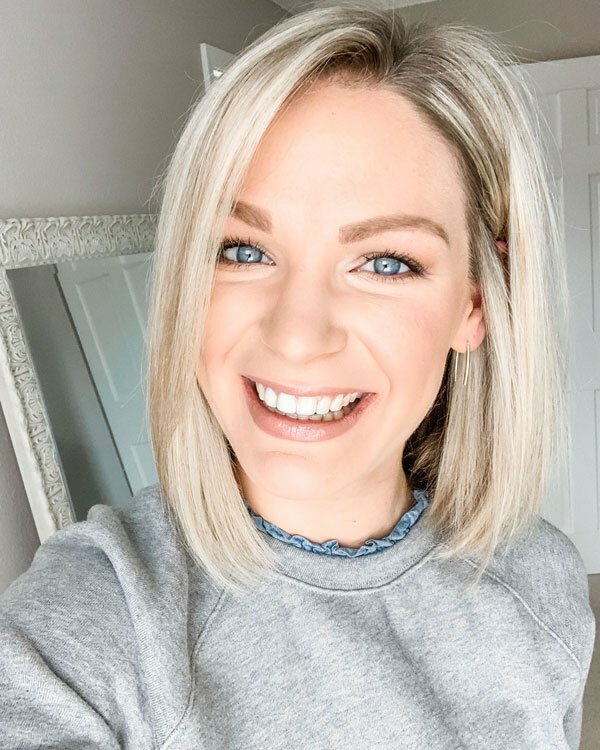 I'm obsessing over this festive look! Your scarf is so fun, what a great find for 4th of July!! 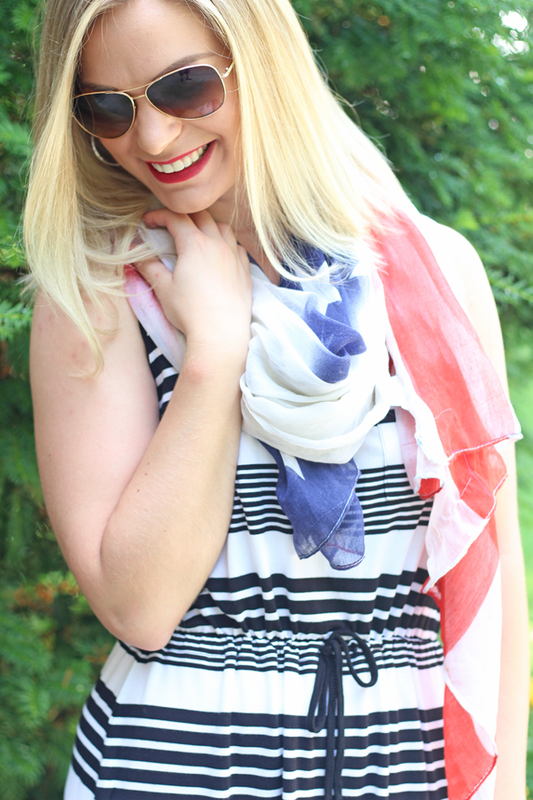 This is a perfect 4th of July outfit – loving that scarf!! And you're totally rocking the red lip, I wish I could pull that off! LOVE this all the way down to the perfect red lip! Awe, thanks girlie! These definitely weren't my best photos, but sometimes, you just have to make do with what you have, you know? I love that scarf – I literally throw it on over anything if I need a little extra color or accessory! Thanks, girl! And, yes – you've said that about the same sandals that I have that are a neutral color! 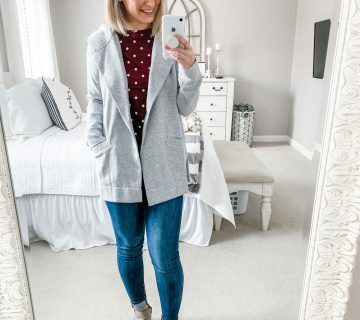 I wish Old Navy was stocking them again this year – they are so comfortable. 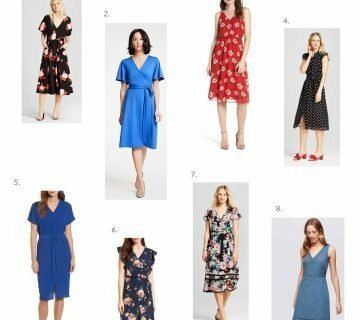 Yes, easy and lightweight – my criteria for all summer dresses! It's a new-to-me brand, but I absolutely love this dress! My mom found it for me at Costco, of all places. Thanks, girl! I love those sandals, too – great clearance find from Old Navy last year! You are so adorable I love this look on you! 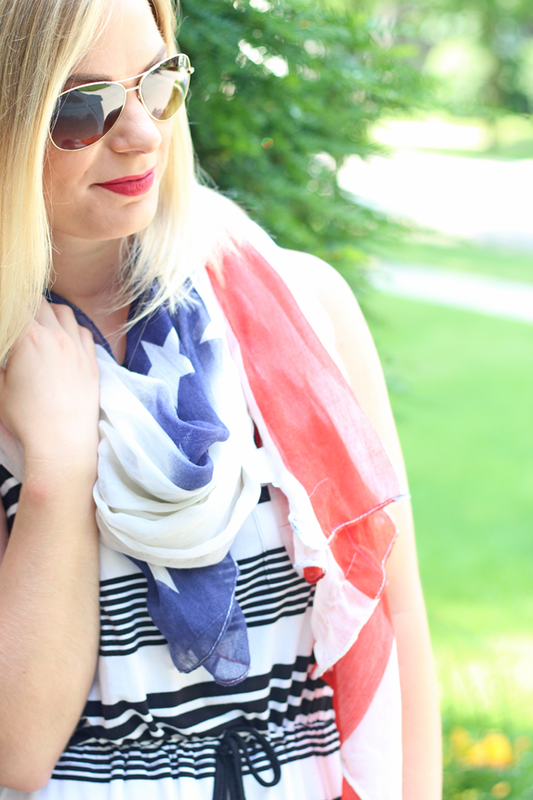 That scarf is so great to throw over any outfit and it pulls it together perfectly for the 4th! I am all about the Summer scarf, such a great accessory. Such a cute dress and perfect for the 4th! Loving the stripes! This dress looks perfect to beat the heat – I love the scarf tied in… getting all the patriotic elements into one outfit is the best! I think I've commented my love on your shoes before? Maybe? But I love them so! You look adorable! I absolutely love this outfit! Great dress and love the scarf! We carry Olive and Oak at the store too. 🙂 I hope that you had a nice weekend too!! this scarf is everything!! perfect for the 4th! LOVE. Those sandals are so cute! 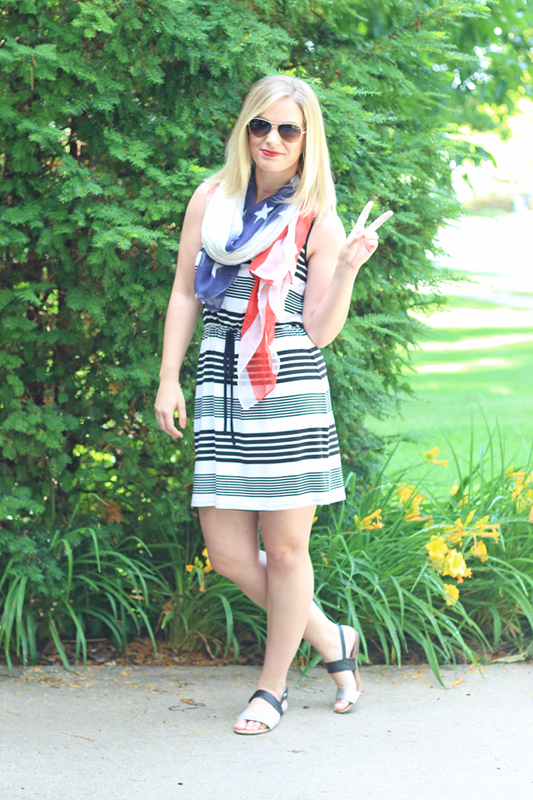 I love the flag scarf mixed with the strips in your dress too- such a good combo!